With back to school comes a lot of paperwork to organize and keep track of and Landee has come up with a great way to keep it (and lots of other stuff) organized. She created her own magnetic wall. This comes in handy if you have a stainless steel refrigerator that isn't magnetic. I didn't even think of that when I bought ours. My husband loves that I can't cover it in school papers though. 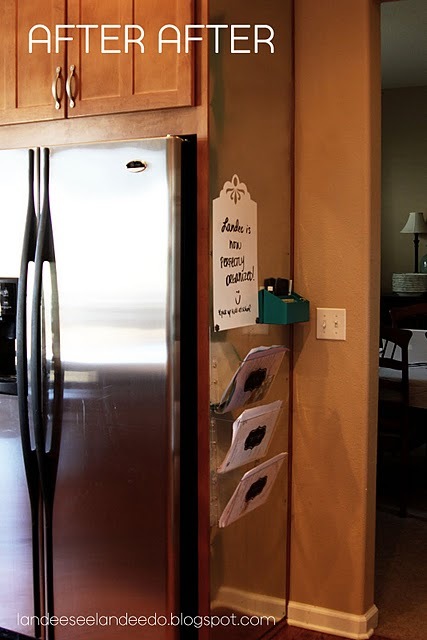 So if you are like me and need a new magnetic option, check out her this handy project over at Landee See, Landee Do. Come on come on!! Get to the Halloween stuff already!!! I've been waiting all year!! !